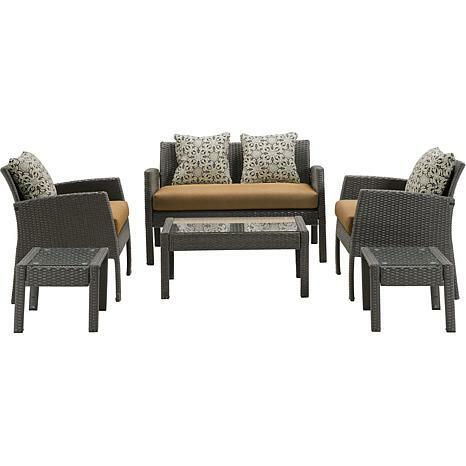 Spend more time lounging outdoors with the Chelsea 6-piece Patio Set by Hanover Outdoor. 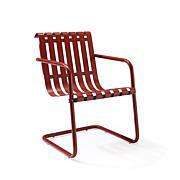 Perfect for smaller spaces, each piece features durable, hand-woven construction over heavy-duty steel frames. All tables include clear tempered-glass tops, cut thick for added protection. The end tables stow away easily underneath the coffee table, creating a space-saving display. 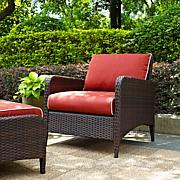 Thick foam cushions offer hours of comfortable seating, while plush accent pillows add a pop of color to the set. 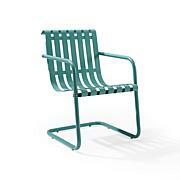 Designed for years of outdoor use, the Chelsea Collection instantly creates an inviting conversation space for you and your loved ones to enjoy. 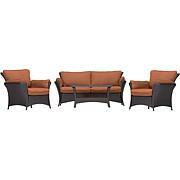 Orleans 3-Piece set of wicker rocking chairs and tableConstructed with all-weather materials that resist rust, moisture, and UV fadingDurable steel frame powder coated for protectionTimeless look that blends well in any scenerySide table features a tempered glass-topSeat Dimensions: 16.34"H x 18.11"